Outdoor enthusiasts have endless recreational opportunities with Glacier National Park, the Bob Marshall and the Swan Wilderness Areas located nearby. Flathead Lake offers fishing, boating and other water activities. Click on the links below for more information. Festival of the Arts - August. 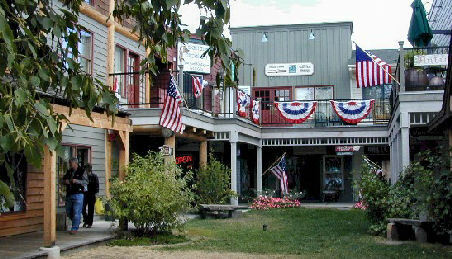 Main Streets of Downtown Bigfork. Web site featuring the events held in Bigfork. Bagley Guide Service. Phone: 406-837-3618. Bigfork Anglers. 405 Bridge Street, Bigfork, MT 59911. Phone: 406-837-3675. Crane Mountain Guide Service. Phone: 406-837-0918. Flathead Lake Charters. PO Box 8074, Bigfork, MT 59911. Phone: 406-837-3632. Two River Gear. 603 Electric Avenue, Bigfork, MT 59911. Phone: 406-837-3474. Trailhead starts at the east end of Grand Avenue in downtown Bigfork. Bob Marshall Wilderness Area. Flathead National Forest. Flathead National Forest. Swan Lake Ranger Station - 200 Ranger Station Road, Bigfork, MT 59911. Phone: 406-837-7500; Fax: 406-837-7503. Downhill skiing, fishing, floating, rafting, hiking trails, scenic drives, hunting, fishing, berry picking. Jewel Basin. Flathead National Forest. Hiking and over 20 lakes provide fishing for cutthroat and rainbow trout. Wayfarers State Park. 8600 Mt. Highway 35, Bigfork, MT 59911. Phone: 406-752-5501. GPS: 48.0548; -114.07543. Located on the northeast shore of Flathead Lake, Wayfarers Park is popular with photographers with an abundance of wildflowers to enjoy, a nature walk over rocky shoreline to cliffs with a beautiful view of the lake and picnic areas. Blacktail Mountain. 30 minutes from Bigfork, west of Lakeside. Whitefish Mountain. Located nearby Whitefish. Mountain Mike's Rental Bikes & Guided Tours. 417 Bridge Street, Bigfork, MT 59911. Phone: 406-253-2453. Wild Wave Rentals. 180 Vista Lane, Bigfork, MT 59911. Phone: 406-253-5800.